May 31 2016: Today was an exciting day for the School of Rock participant because it involved the two words that every student lives for during a school year: FIELD TRIP. Yes, we were stepping out of the classroom and into the field for a day of hiking and exploring the geology of Cape Town. Our planned itinerary for the day included five hikes, narrated and arranged by two local geology experts: Professors John Compton and John Rogers. Just a couple of words about these two tour guides. Never have I had the privilege of hearing from the extensive knowledge and wisdom of two individuals in their chosen profession than Professors Compton and Rogers. Although it is probably difficult to compress a semester of Geology 101 into a single day, but these two individuals did just that. It was a lecture combined with a hands-on field experience which made for the most ideal learning opportunity for School of Rock teachers – many of whom had never had formal training or coursework in geology. Knowledge aside, they were also personable, approachable, eager to respond to questions, and at times, downright funny. School of Rock teachers met in the conference room at 7:00 am for an early start to a busy day. After roll call and general instructions, we proceeded to the bus and on to the site for our first hike of the day. During this stop, we ventured onto a beach site where we noted general displays of quartz, siltstone and granite. Of course, the shores of a beach are strewn with unique sea shells of all types, shapes and sizes, but the most fascinating observation (especially to the biology teachers) was the enormous-sized kelp that was stretched out along the shore. As we continued on this hike, we ended at a special site: the point where Charles Darwin ended his journey on Voyage of the Beagle in 1836. Many people, particularly scientists, correlate Darwin with biology, but many do not know that Darwin had a passion for geology and was actively investigating rocks and noting his observations. The second hike of the day was atop of Signal Hill where we were able to see a view of the harbor, Cape Town, the newly built soccer stadium for the 2010 World Cup of Soccer, and the surrounding mountains. One site in particular that captured my interest was Robben Island which was also visible from our vantage point. This was where Nelson Mandela was imprisoned for many years for political crimes against apartheid. As we were listening to Professors Rogers and Compton speak about the geology of the area, we noticed a very loud explosion. It took many of us by surprise. It turns out that the explosion was the discharge of a cannon (without ammunition) conducted by the local observatory to coordinate with the time of 12:00 noon. 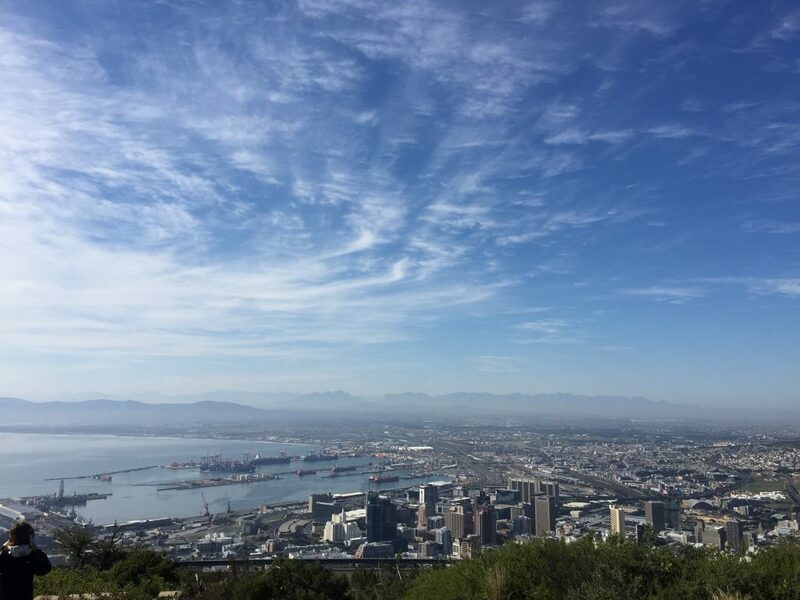 This hike was at the top of a magnificent geological formation known as Table Mountain, often referred to as one of the new 7 wonders of the world. It is referred to as Table Mountain because the peak does not culminate into a convergent point but rather it is a flattened surface resembling a table top. Although it is possible to hike to the peak of Table Mountain, we chose the alternative form of transportation – aerial cableway. 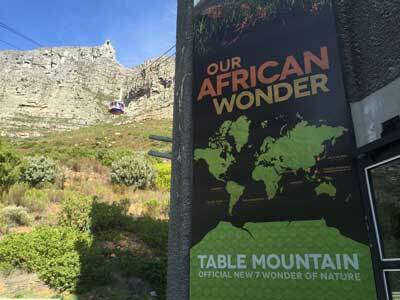 We all loaded into a cable car – capable of housing 65 individuals, and proceeded to the top of the mountain. The views were breathtaking and, because the floor of the cable car rotated – each passenger was able to enjoy the ride from different perspectives. We got to the top and following a bite to eat for lunch, proceeded to a hike of the Table Mountain National Park. steps as we moved from the street side onto Clifton Beach. Of course, 156 steps is what I counted and the number did vary but there were definitely over 100 steps. Although it did not seem very far from the road side to the beach, it took quite a number of steps to make it there. We walked along the beach, noted nearby rock formations and then returned to the bus. 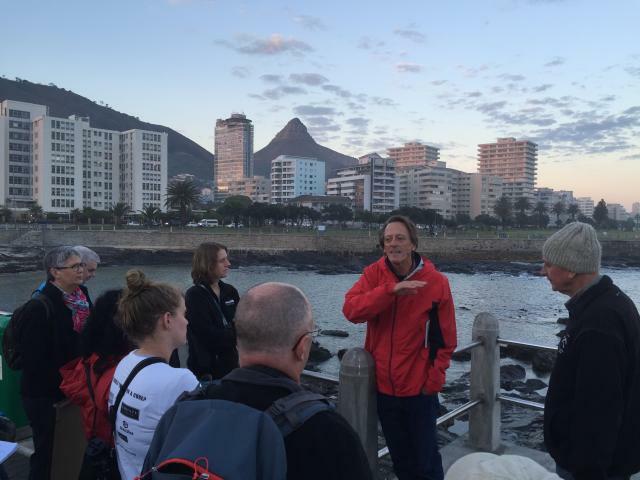 We ended the day with dinner at Cape Town Harbor and then back to the ship for a good night’s sleep.